There suddenly appears in the midst of the Monroe County countryside north of Sparta, an unusual sight - a fantastic garden of concrete sculpture decorated with thousands of glittering glass shards. Transforming ordinary materials into an ambitious series of patriotic and religious monuments, Paul and Matilda Wegner created a remarkable "Grotto." 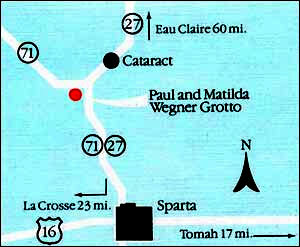 DIRECTIONS: North of Sparta off Hwy 27, west on Hwy 71, near the town of Cataract. Paul and Matilda Wegner began building the Grotto at their farm home near Cataract, Wisconsin, after their retirement in 1929. Developed over a period of several years, the extraordinary sculpture environment slowly grew to include a fanciful American flag, a giant reproduction of the Wegners' fiftieth anniversary cake, a glass-encrusted birdhouse, and a twelve-foot concrete facsimile of the celebrated Bremen ocean liner of the 1930s. Other constructions were religious in nature. The magnificent Prayer Garden, Glass Church, and Peace Monument once served as places for quiet reflection, wedding ceremonies, pub-lic preaching, family picnics, and community gatherings. Still surrounding the yard is an ornate fence with a concrete archway, which spells out the word "Home" in crushed black glass. The Wegners engulfed the Grotto in color and light by decorating their concrete sculpture with a brilliant mosaic of shattered glass and broken crockery. Hidden within the thousands and thousands of sparkling shards are a number of curiosities - broken beer bottles, iridescent carnival glass, old heirloom china, the remnants from a few porcelain figures, seashells, Indian arrowheads, and gunpowder casings. It is the Wegners' fantastic vision and their imaginative use of such unexpected materials, which make their Grotto a significant work of art. Neither Paul nor Matilda Wegner received any formal training in art. Their imaginative Grotto arose from a powerful personal vision outside the academic tradition of fine art and beyond the ethnic or community traditions of folk art. Such "outsider" artists, also referred to as self-taught or grassroots artists, have built other unusual art environments around the state. In fact, it was another of these wondrous creations, the Holy Ghost Park by Father Mathias Wernerus in Dickeyville, Wisconsin, which inspired the Wegners to begin their amazing "retirement project". Paul and Matilda Wegner emigrated from Germany in 1885, settling first in La Crosse, Wisconsin where Paul worked for the railroad. In 1889, they purchased a farm at Tubbs Corners near the village of Cataract in Monroe County. The couple farmed the land until 1916 and raised five children. In 1916, the Wegners moved to Bangor, Wisconsin, where Paul owned and operated a car dealership. They retained ownership of the farm, leaving the actual operation to their son Charles. After Paul's retirement in 1927, the couple continued to live in Bangor during the winters but spent their summers at their Cataract farm. With the time provided by their retirement, the Wegners began construction of the Grotto at their summer home. The building continued from 1929 until after 1936. On-site construction was accomplished over the summer months; however, many pieces, including the walls of the Church, were created in Bangor during the winter months and then transported to the farm for installation. On March 19, 1937, Paul Wegner died after a long illness. His funeral was held in the Glass Church. Matilda continued to work on the Grotto, adding finishing touches to many of the pieces and creating colorful embellishments for the nearby cemetery where Paul was buried. Matilda died in 1942. Paul's and Matilda's graves are marked by monuments similar to the sculptures found in the Grotto. The Wegner Grotto, known locally as the Glass Church, was owned by the Wegner family until purchased by the Kohler Foundation, Inc. in 1986 as part of its commitment to the documentation and preservation of significant outsider art environments and folk architecture. Restoration, funded by the foundation, included extensive structural stabilization and surface repair of the sculptures as well as landscape clearing to reestablish the environment. The site was gifted to Monroe County in September 1987 and is managed through the Monroe County Local History Room. Restoration and preservation of this fragile site is ongoing. In 2006, the Wegner Grotto Endowment was established to ensure the long-term care and preservation of the Grotto. Your generous contribution to the Wegner Grotto Endowment will help us in our efforts of preserving, maintaining, and enjoying the Wegner Grotto for years to come. Your tax deductible contribution to the Wegner Grotto Endowment works to preserve, maintain, and promote the Wegner Grotto-Monroe County's very own Grassroots Arts Site. "YES! I want to help preserve the Wegner Grotto"
Please make check payable to: "Wegner Grotto Endowment"
Want a unique and serene location for your wedding ceremony? Consider getting married at the Wegner Grotto. Holding weddings at the Wegner Grotto has been a Grotto tradition since it was first constructed in the 1930s. Contact the Monroe County Local History Room at MCLHR@centurytel.net if you would like to know more about this unique opportunity. Among the grandest, most astonishing, and original visions in American art are the large-scale works of artist-environment builders. Click on the link below to learn about other art environments and grottos to explore in Wisconsin.